A tiny house on wheels featuring a main-floor bedroom. No need for a ladder! Fall is coming and we can't think of a better way to enjoy it, than with a friend and a bottle of local wine, on your own private deck! Deck chairs? Check! Wildlife? Check! Located within a short drive to Portland, and several amazing wineries; if you choose to explore, you won't be disappointed. If you'd rather stay in, our secluded 148 sq ft tiny house has all the amenities of larger accommodations including convenient parking, games, books, an eat in kitchen, and an ultra-comfy "nest" bed. Nestled in a quiet forest, at the end of a gravel driveway, complete privacy is ensured. The entire home and deck is yours to enjoy! In the morning, feel free to enjoy coffee on our deck, during the day you can tour the local wineries and antique stores. And, in the evening, watch the stars from our comfortable outdoor space. My goal is to exceed your expectations, and I take my role of Hostess very seriously. With the goal of providing my guests with a unique and comfortable experience, I am a very proud to say I am an official "Hostfully Hostess." This means when you stay with me, you get a Hostfully guidebook link emailed to you. The guidebook contains all the essential information about my tiny home (including how to use the dry flush toilet) as well as recommendation for activities, shopping, hiking, and restaurants all over our lovely town of Sherwood, Oregon. It's easy to navigate, and if you are out and about, you can access it from your phone. There are two options for check in: 1) I can provide the front door code and have a detailed hardcopy and online link for our Helpful House Handbook available or 2) If you prefer an in-person check in and orientation (tiny houses and dry flush toilets are rather unique and often require some instruction) just ask! Please, please, do read the Helpful House Handbook. Tiny Houses are unique and your comfort will be GREATLY enhanced if you're familiar with the features. For instance, guests will need to use ONLY the shampoo, conditioner, soaps, cleaners and blow dryer provided. Come enjoy our new fire table! This is a truly rare and unique opportunity to "try on" tiny house living. As such, all guests must read instructions, and agreed to use, our dry flush toilet and the100% biodegradable cleaning and bathing products that are provided. Michelle's tiny home is indeed small, but darling. The colorful curtains and furnishings are very cute. The dry flush toilet sounded intimidating at first, but was actually very easy to use with the detailed (and funny) instructions. The bed is a little awkward to get in and out of given it's position at the end of the tiny house, but still quite comfortable. Cute spot! My husband and I had the lovely pleasure of staying in this "Tiny Perch" for one night. This was our first experience staying in a tiny house and it was wonderful. MJ was a great host, she maintained great communication leading up to our stay. Her "Tiny Perch" was wonderfully decorated, bed was super comfy and it was well stocked with essentials. Nothing went unnoticed, we appreciated the snacks and drinks that were placed for us upon arrival. If we are ever in the area again (weekend getaway from Texas) we will most definitely stay here again! It might be small in size, but has great functionality. We spent 10 days there and loved it! 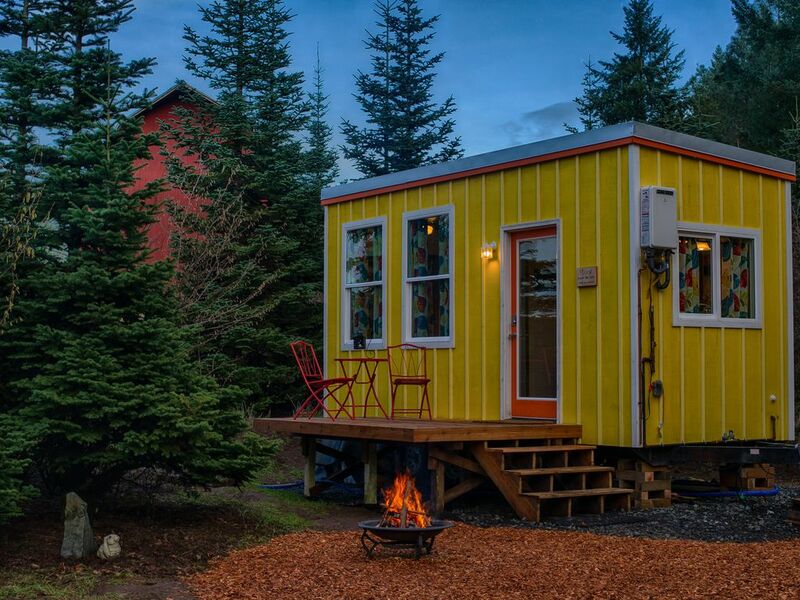 If you've never experienced a tiny house, this should be the one. It is so well built and designed. You will be amazed at all the amenities tucked away in this small space. You can cook a full meal, play games, watch movies, read a book from the in-house library, and sleep comfortably. MJ is the perfect hostess, and even has some surprises tucked away for you to discover. The setting in the woods is so quiet. We did enjoy the deer and variety of birds. However, it is also conveniently located between two towns with lots of restaurants, shopping, and wineries. Staying in this tiny house checked off a great new experience from our "bucket list"! This was our first experience with tiny house living. It was great! Michelle has a really great eye for details and hostessing! The location was awesome at the end of a quiet lane. No traffic, just sounds of nature! The bed was comfy and cozy. Michelle provided fresh ground coffee and organic half and half, English muffins and eggs, and bottled water and juice. The kitchen was well stocked with everything we needed. We enjoyed playing cards at the cute kitchen table while the rain came down. We took advantage of using the fire table our first evening there. It's a short drive into the town of Sherwood. The house was perfectly clean and is dearly loved! We highly recommend staying there. Michelle checked in with us to see how we were doing. It was nice meeting her smiling face on our last morning. She's a great person with a great little house. Give it a try...you won't be disappointed! Thank you so much for your darling note in the guest book and your kind words here. I enjoyed meeting you both and appreciate the opportunity to host you. Such a nice little place with everythinf you could possibly need taken care of. I will have to remember the tiny yellow house next time I visit! Thank you! So glad you loved it and you’re welcome back any time!! A really cute place! Inspired us to design our own tiny house! A great tiny house experience! Thank you! I’m so glad you enjoyed your stay! Come back any time.